Are you looking for a 100% reliable dance floor hire company? Once again this weekend I stepped in at the last minute to assist a young lady who was very distraught because her dance floor that she had ordered from another company had been cancelled last minute! Unfortunately I can’t name and shame the company who did this to her. She had booked a budget priced dance floor and I couldn’t believe how cheap the deal was that she had been offered. It was less than half of what I would charge! It just shows exactly what I’ve always said about budget suppliers. If you book something that’s ridiculously cheap you may well regret it. Luckily I had one of our beautiful dance floors available and arranged delivery to a venue near Pathhead called The Stair Arms. 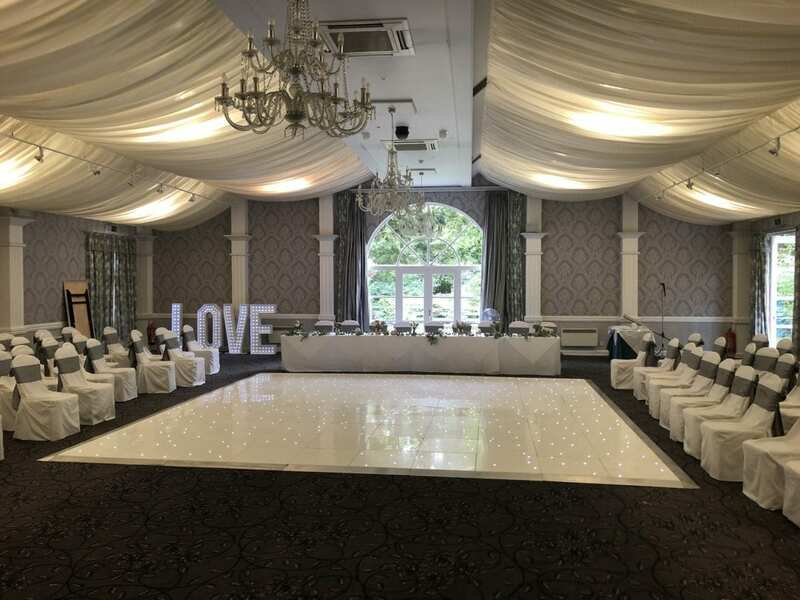 Delivery and set up all went fine and the young lady was extremely grateful and my delivery driver was thanked on numerous occasions for supplying a dance floor hire at the last minute. Recently I’ve heard from many people about dance floors that either didn’t turn up or were very dirty and didn’t look the part. Quite often I hear about dance floors that have panels that don’t remain lit or split apart. The problem with floors that don’t remain lit or have a panel or two that stop working during the night is fairly common. Led dance floors need a lot of cleaning and maintenance. They have little copper connectors that join each panel electrically and if these get dirty or are damaged that panel may not light up or, worse still, stop the whole dance floor from lighting up. There are several different manufacturers of dance floors, the cheaper ones use a power supply that has fuses in it and if a temporary fault appears the fuse blows and then needs replaced. This is not a good idea. My Dance floor uses a different power suplly which has a self resetting power supply that doesn’t blow its fuses. Once the fault condition is rectified the whole dance floor comes back on. We also always carry a spare power supply unit and for the first time ever we had to use it last weekend. It’s always good to carry spares, we carry an extra two big panels and two small panels to every job plus a spare powered edge and spare edges, corners etc. When we deliver our dance floor it is powered up and lights up as we lay it. This means if we spot a faulty panel it can be replaced straight away. If you wait until the end before you power up the dance floor if a panel doesn’t work you have to remove all the panels and start again. Once you’ve done this once you’ll never make the same mistake twice! At Platinum Discos we go to great lengths to make sure our dance floor hire is the best in Scotland. All of our dance floors go through a cleaning, polishing and buffing procedure at least once before they are relaid. We like to clean a dance floor as we collect it where possible. We then sometimes clean it again at our warehouse before reloading it for delivery. At this stage it gets re polished and buffed. When we deliver the dance floor the panels are usually immaculate but if any finger marks etc have appeared we give it another polish and a buff to make it shine! Every month or so we give the dance floor a deep clean and strip off all the polish and remove any scratches etc then buff it, polish it and buff it again. It can take a few hours! At some venues where we get to deliver the dance floor earlier in the day we give it an extra clean, this really helps keep the floor immaculate. Heres a video of me cleaning the floor at Keavil House Hotel in Crossford near Dunfermline that shows just what’s involved in cleaning our floor. The second video is the final cleaning and buffing and the mirror shine effect that our floor gives after it’s been cleaned. Platinum Discos provides discos and dance floor hire anywhere in Scotland and Northern England. 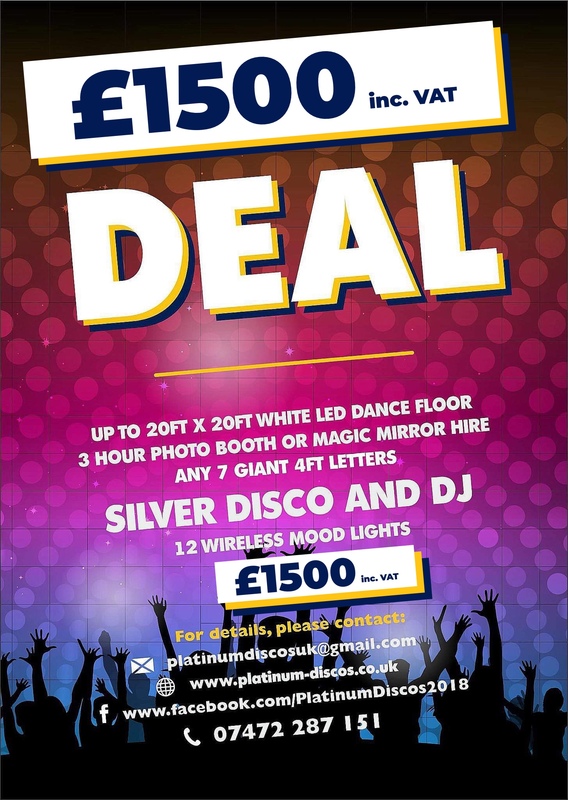 Platinum Discos also offer dance floor hire as part of our £1,000 deal which has to be the best value deal of its kind in Scotland. We can provide this anywhere in mainland Scotland and Northern England and in other areas at an additional cost. This amazing offer is incredibly popular and once you see what’s on offer you’ll understand why. Here is the official advert for it which we recently upgraded and added even more to this incredible deal. Dance floor hire is of course part of this deal and when you consider that the dance floor hire alone is worth £600 you’ll understand just how good value this is! If your thinking about the £1,000 deal please read this article that I wrote which describes a wedding I did for Kylie and Peter at Drumtochty Castle in Aberdeenshire where they hired the £1,000 package. It also includes a lovely review from Kylie who was extremely happy with what we provided as you’ll see by her review. To hire one of our amazingly shiny white led dance floors please fill in our contact form or call me on 07472 287 151.